We're under an excessive heat watch for the next week. 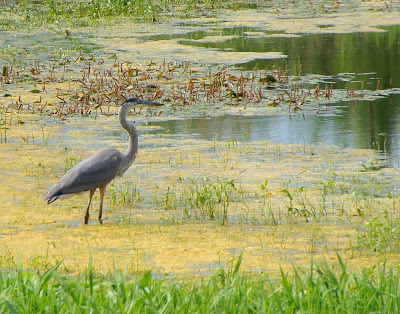 I think I should follow this Great Blue Heron's lead and just stand in the water all day. Although, after several days of excessive heat, I imagine the water will end up pretty warm and won't be too refreshing. Besides, I prefer my fish cooked unlike what this Heron is planning on for dinner. 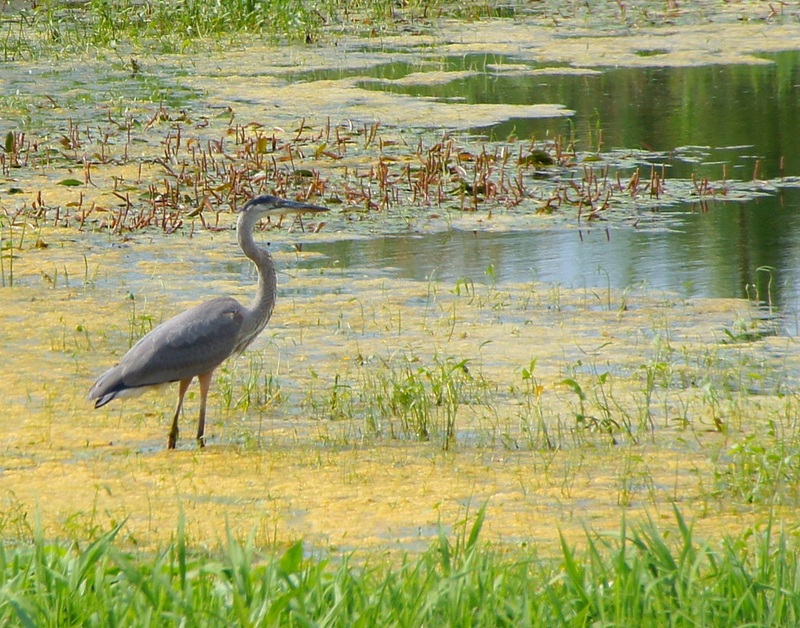 I saw this Great Blue Heron standing in my neighbors' pond when I was on the way back from taking some baler twine to Hubs. I had to stop for a quick photo, although I didn't think it would come out very good, considering I was quite a distance from it. However, the new camera (Sony a580) continues to impress me. While it's not the best photo, the camera sure did allow me to get an "O.K." photo out of something that I wouldn't have otherwise. I'm glad you got the photo. I like it, but I'm no expert, LOL. I've got my camera critters all in a row and waiting for morning. See you then. Misty, you got a great shot of the heron with yoru new camera. My C C Link Hope you have a great weekend. You are suffering a heat wave and we are getting blown about in a rain storm! Ditto: heatwave and shore birds! Looks like a water color-- lovely. I just got my first dslr camera and it is a Sony! Yay, Sony! I love the composition in the image...very nice. Your photo is more than just okay. Keep on clicking. Looks like a darn good shot to me! One of my favorite birds to see and photograph! Gorgeous! I wish you many, many more wonderful photos.